Each machine inclues setup and delivery in the delivery area. 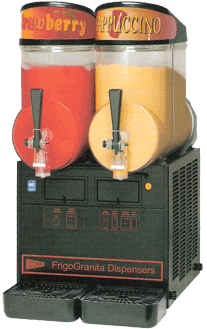 Alcohol is optional for all mixes and is the responsibility of the customer to provide. $20 each additional mix Our most popular mixes serve approximately 65 nine ounce drinks! Any unopened mixes can be returned for a refund. A $50 deposit is needed to reserve your date. If reservation is cancelled, $50 will be applied to your next rental within 6 months.